Unbeatable mobility and versatility thanks to the single-axle principle in combination with the optimum mix of water pressure, water volume and optimum hot water temperature. Due to the design, these units can be ready for operation in minutes. the diesel engine speed can be manually adjusted. the high pressure pump and also both the high performance burners are independent on an external supply voltage. thanks to the built in water tank, it is possible to carry out cleaning work flexibly and without an external water supply. Hot and cold water, diesel drive are ideal for cleaning and refurbishment professionals, and for all users who make very high demands. It offers the optimum mix of water pressure, water volume and optimised water temperature. 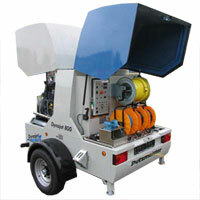 Due to its design, the 800 can be transported to the site of use fully ready for use. 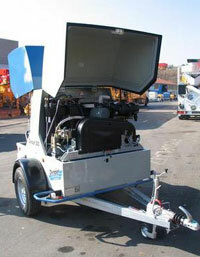 The diesel engine speed can be manually adjusted. Neither the high-pressure pump nor the two high performance burners are dependent on an external supply voltage. Thanks to the built-in water tank, it is possible to carry out cleaning work flexibly and without a stationary water supply. Ideal for cleaning facades, old buildings, vehicles, construction equipment, formwork, scaffolding, etc. and for refurbishing facades, balconies and old buildings. 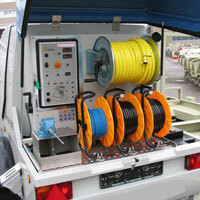 All these features prevent the unit against harmful working conditions. Any of these cases will lead to a machine stop. After a successful high pressure cleaning operation during winter time, a push button allows running the unit in anti-freeze mode and will flush all water contained parts with anti-freeze. A three chamber water tank is integrated into the chassis with a total water capacity of 265 gallon. This allows a continuous jetting operation of 45 minutes. As water blasting is an intermitted operation it can be said that a 1 hour water supply is possible. Therefore cleaning jobs in different places of industrial installations become more easy and can be performed in a time saving way. The adjustment of the working pressure is done via the diesel engine speed control. This economical way of operation enables the operator to adjust the working pressure to the actual cleaning task. The control functions of the unit are handled by a simple and sturdy relay control system, which can be easily maintained by any trained electrician. Therefore faulty functions due to electronic failures are excluded. Hot water, diesel engine. Ideal for cleaning and refurbishing professionals as well as all users who have high demands in cleaning. The Dynajet 500th offers an optimum combination of water pressure and water flow rate and an optimum water temperature. 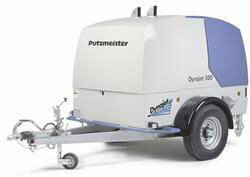 Due to its design, the Dynajet 500th can be transported to the work place completely ready for operation. The speed of the diesel engine can be adjusted manually. Both the high pressure pump and the two high pressure burners operate independently of an external electrical power supply. Thanks to the integral water tank it is possible to carry out cleaning work flexibly and without a stationary water supply. Ideal for cleaning facades, old buildings, vehicles, construction machines, form-work, scaffolding, etc. as well as refurbishing facades, balconies and old buildings. 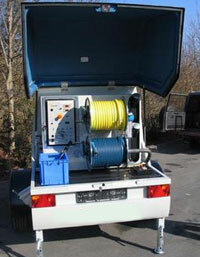 in contrast to many other high pressure cleaning systems, our trailers use only diesel engines. Diesel engines are known for their durability and minimal wear and tear. They are also more economical and offer greater performance than conventional gas-powered engines. This makes them adequate for any task. The integrated high performance burners can heat the water up to 230° F if required. In combination with such high water pressure and large water volumes, they can achieve a cleaning performance which would normally require much bigger and more powerful high pressure cleaning units. Fully automatic control systems monitor all functions and switches off the high pressure cleaning unit in the event of faulty functions. This also applies to the high performance diesel oil burners with flame monitoring. These trailers have large water tanks built into the chassis. Both have a 264 gallon tank. This quantity of water can be used to clean for over half an hour at maximum water output. This is the concept according to which machine space and operator space are separated and are independently accessible. The grey engine hood remains closed during operation. The machine parts are covered, the operator is protected from moving parts and hot surfaces and the machine is quiet. Further-more the engine parts are protected from contamination and of particular advantage for those operating rental fleets - protected from being operated incorrectly. Everything required for operating the machine c an be found underneath the blue hood. The high pressure and water hoses are wound up properly on two hose reels. The central control cabinet houses all the displays and operating elements. Weight (without water) 3528 lbs. 3616 lbs. Dimensions 144" x 82.68" x 82.68" 144" x 82.68" x 82.68"
Each high pressure cleaning unit is built to your specifications. Many options and accessories are available. Below is a ballpark estimate of a typical configuration.